The white marble mausoleum of the Taj Mahal is probably the most famous building in India. Its structure, its symmetry, its proportions make it one of the most beautiful elements of world heritage, in any country. 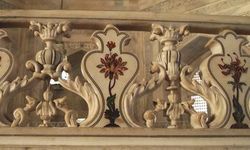 And approaching it makes the experience as interesting as its mere vision from afar, or on a photo: The scriptural or floral decorations, which represent the majority of the elements of the decor of the monument, compete in beauty with the building himself. The rest of this page gives a precise description of the mausoleum. 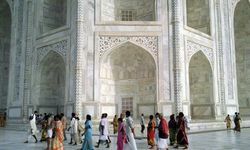 The other buildings or gardens of the Taj Mahal, which is a large site with several parts, are explained on the page containing the description of the Taj Mahal. 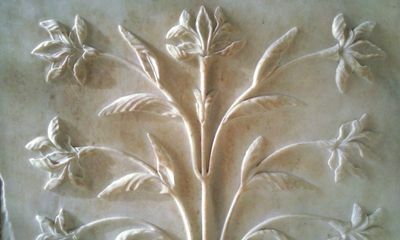 The white marble mausoleum is what anyone who knows the Taj Mahal, that is, a good part of the planet, thinks. In fact it is not completely marble, contrary to what the legend wants. It is made of red sandstone bricks, like many buildings in the area and as are the other monuments of the complex. Sandstone is a rock from the aggregation of sand. It can be a very hard rock, but here it is of a standard hardness, so it can corrode. 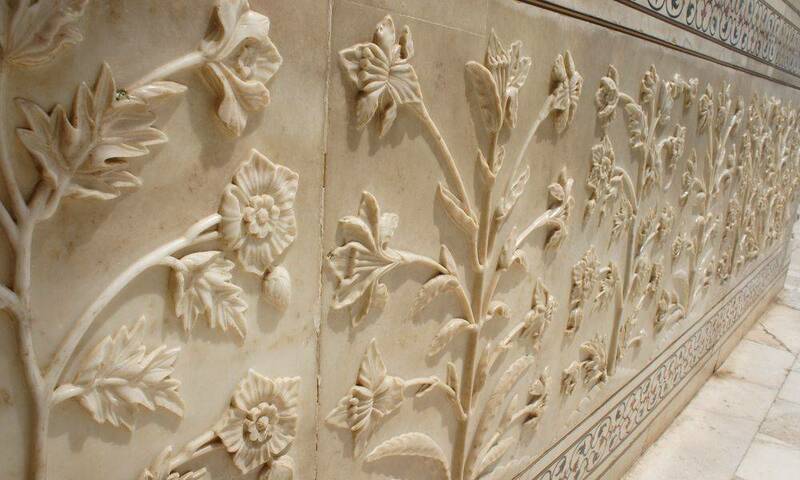 It is just as much to protect it as to embellish it that the manufacturer has made it cover with white marble plates. 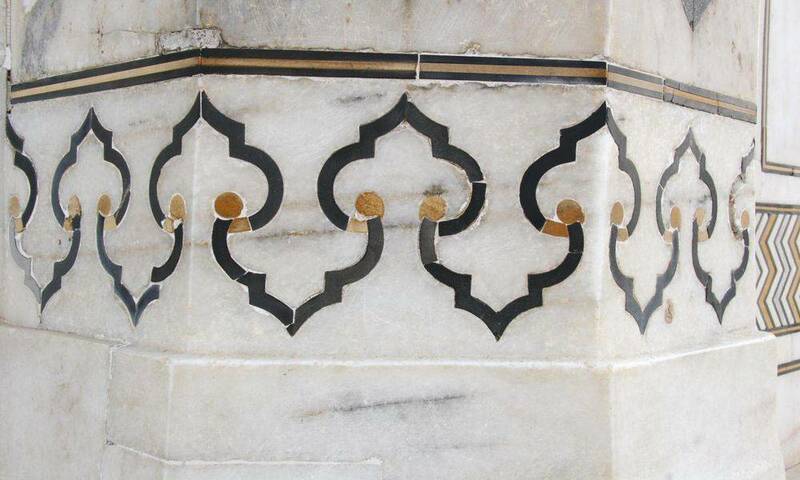 This white color is therefore only a plating, the Taj Mahal is not built in block marble. If white was chosen for its beauty, it was also for its ability to capture the color of the sky and its environment. So, depending on the time of day, you will see it red, orange, tending towards blue, purple, or with green reflections. The mausoleum takes all these colors indistinctly, and it is common to say that it changes color at every turn. This is not true, but visiting the monument early in the morning will give you a different feel than if you do it in the evening. In the middle of summer day, with a clear sun, you will even need sunglasses so white is aggressive. The mausoleum was designed on the basis of a symmetrical plan. 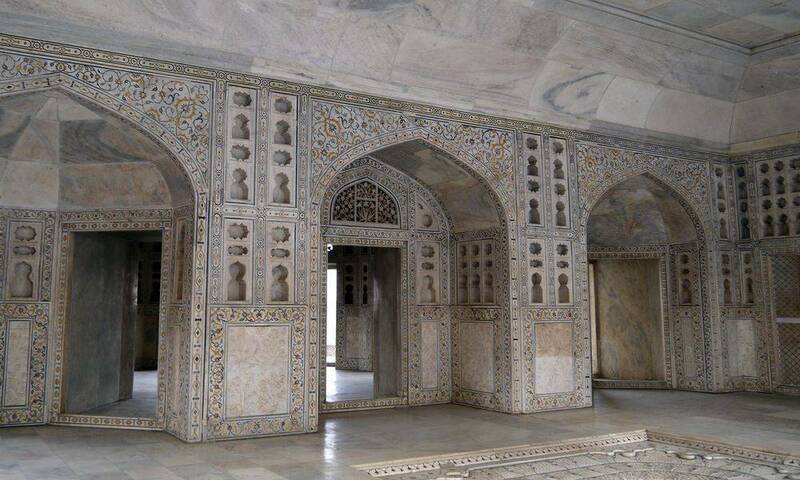 Symmetry among the Mughals was very important, it meant order, rigor, precision, perfection. This is why the imagery of Paradise is associated with the perfect symmetry of things, as the Qur'an quotes it. And the Mughals, let us not forget, were above all Muslims, even if the first 5 emperors, those who made the greatness of this dynasty, were little practicing and pronounced the religious opening. (It was not the case of the 6th, Aurangzeb, who was very stake. If, in the minds of the Mughals, symmetry is synonymous with perfection, everything in the entourage of the Emperor should be symmetrical, and even more so the mausoleum of the Emperor's wife when, for her misfortune, this one died in 1631. 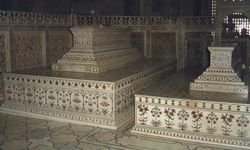 Her name was Mumtaz Mahal and her husband, Shah Jahan, decided to build him the most beautiful tomb that could exist. Obviously, this tomb had to be in the architectural tradition of the Mughals, and the symmetry had to enter for a large part. It is clear that the bet was successful. The whole monument is perfectly symmetrical with a few exceptions, of a practical nature: The stairs. Two of them go upstairs, one side North and one South. They are not symmetrical to each other but face each other. The 3rd staircase leads to the crypt where, as the Muslim tradition wants, the bodies must be put in the ground. It was therefore necessary to be able to go down to the ground level, which is done by this staircase that the visitor can not borrow. To have a perfect symmetry it would have been necessary to dig four stairs, one by side, but it is not what has been done, there is only one. To see the tombs, two cenotaphs were installed in the central room (A cenotaph is a false tomb, a tomb in which there is no body of the deceased). The largest is in the center, just under the arch. It's Mumtaz Mahal's. The other, just as worked but slightly smaller, is Shah Jahan's. As he is next to his wife's, he breaks the symmetry. It is also the same thing in the crypt, the position of the tombs is identical to that of the cenotaphs. The rest of the mausoleum is rigorously symmetrical. Four sides of the same size, each offering a wide iwan (very wide and high porch typical of Islamic art), adorned with two smaller iwans. Each side joins the next by a truncated corner containing another iwan, small. The floor is composed of these same little iwans perfectly superimposed. On the roof the dome is central, round in shape. There are four smaller domes at the four corners. Nothing in the exterior structure of the mausoleum breaks the perfect symmetry of the monument, except for the two staircases leading upstairs and cleverly hidden by the facade. Inside we find the same symmetry. 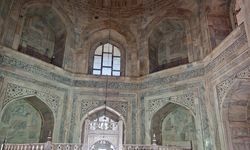 The four main iwans lead to four richly decorated intermediate rooms, connected to both the central hall and the four secondary, octagonal chambers. They contain, apart from the 4 "corridors" leading to it, a kind of small central basin. All secondary iwans lead to a secondary chamber. All the plan is made to direct the visit to the main room, a marvel of perfection in proportion. The ceiling, very high, is very well decorated too. The center of the main hall, those of cenotaphs, has in its center a balustrade delimiting the forbidden space. 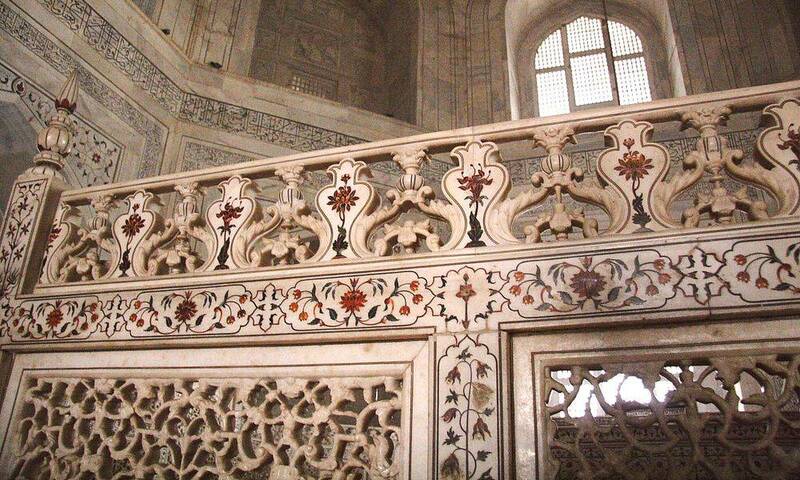 By looking precisely, you will see that this balustrade is carved marble, inlaid with semi-precious stones. The making of this balustrade must have taken a long time and probably required the work of many experienced artists. It is in itself a reason to visit the monument so the quality of the work is extraordinary. The patterns represented are floral, mainly grapes, various fruits and flowers, they are so perfect that properly colored, they could pass for real. It should be noted that the entire balustrade has been polished, which represents another gigantic work. Building a perfectly symmetrical monument is not so complex as that, if one exempts both the imposing size of it, the quality of its execution and the riches of which it has been trimmed. On the other hand, making a well-proportioned building is much more difficult, especially since at the time of its construction (1631-1653) there were few means of simulation. The very form of the Taj Mahal is quite original, as it was infrequent to have to build such a large building. Its size allowed fancies, like putting 12 secondary iwans to the 4 main ones, but it is its proportion between the width of the sides and its height which is most original. 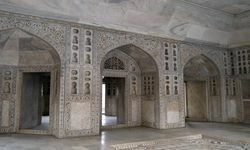 Usually, the members of the Mughal nobility had built lower mausoleums, the proportion of which made them closer to the ground, less airy. The domes, which were frequent, could not make them so high. 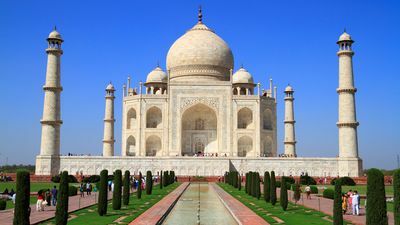 At the Taj Mahal, on the contrary, it is the whole monument that grows towards the sky, the dome only bringing an additional "arrow", much like the Gothic cathedrals of the Middle Ages, in the West. To reinforce this impression the dome was placed on a drum, a piece of cylindrical architecture the width of the base of the dome. He raises it, as is the dome of the Capitol, the seat of the US Senate (for example). But here it is 7m. The dome of the Taj Mahal is accompanied by four other smaller domes placed on octagonal types of very openwork as each of the 8 sides is largely open by cutting the ogival-shaped wall. These side domes have a difference in size with the main: They are not bulbous. These dome annexes are perhaps the only reproaches that could be made to the complete monument: They are too close to the principal, which weighs a little. This is due to the fact that they are stacked above the secondary rooms, the plan being done so. Inside also the proportions are ideal. 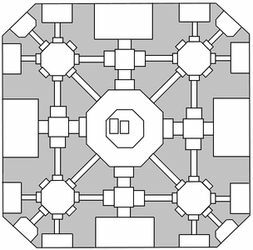 The proof is on the dimensions of the central room, measuring 35m in diameter for 35m high ceilings, or the perfectly identical spacing between each secondary or intermediate room. Even the central balustrade is an ideal proportion: 8m per pan, it occupies the central part of the large room. The style of the Taj Mahal is special, it's actually a mix. It is at the crossroads of Persian, Islamic and Indian architectures, and there are specific reasons for that. 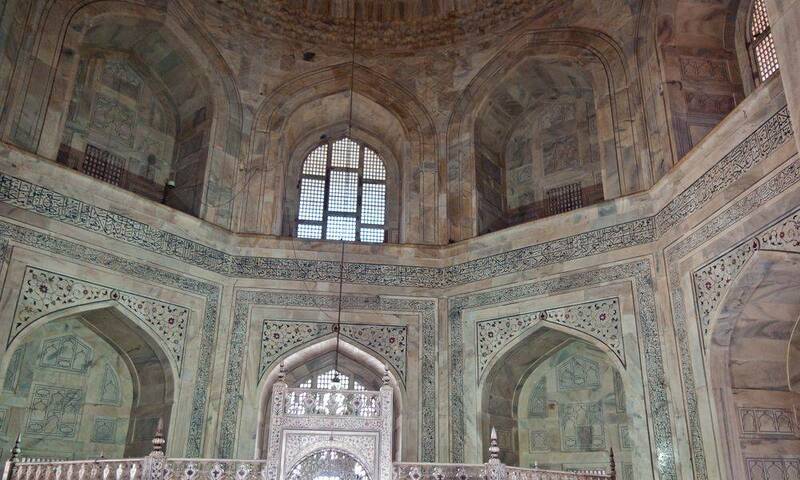 It was built between 1631 and 1653 by Shah Jahan. The latter was a Mughal emperor, a dynasty ruler over India from the sixteenth to the nineteenth century, but its founder, Bâbur, came from a Turkish-Mongolian family. He is Muslim by his father but had Mongolian blood from his mother, a descendant of Genghis Khan himself. When Islam spread from the eighth century it brought with it an architectural style of Arab civilizations inherited by Babur. His descendants having forcibly colonized northern India, before colonizing all of India, had to adapt to the conquered peoples, mostly Hindus, Sikhs and Rajputs, but also Bengalis, Afghans, etc. . Most of them were Hindu and were able to keep their traditions, their religions, without this posing too many problems to the various emperors, reluctant to impose Islam on their land (with the notable exception of Aurangzeb, son of Shah Jahan, but he will arrive later). It was therefore normal that, immersed in the dual Islamo-Hindu culture, their architectures evolved as well. Moreover, architecture was not the only area where such a mixture was found: The art of miniature, strongly connoted Islamic, evolves rapidly in a Hindu style under the protection of the Mughal emperors. Dance, music too, but testimonials are rarer. 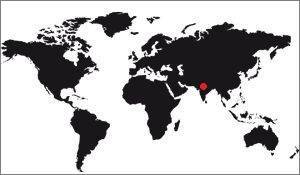 As for the Persian culture, it is very old and resides on the current Iran-Afghanistan-Pakistan zone, the most number of countries of the former USSR (Tadijikistan, Uzbekistan, etc.) All these people were of Persian origin and shared a lifestyle. Moreover in Uzbekistan the architecture is very close to what we can see in Pakistan, as regards the monuments. The proximity of the Mughal Empire and the Persians have fostered trade, although it must be said that history has bequeathed more conflict between the two powers than fruitful trade. It is natural that part of Persian art has found itself in Mughal art, and vice versa. 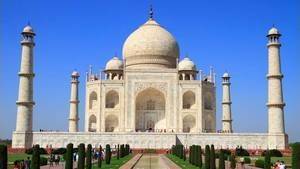 But there is another reason for the presence of Persian art in the Taj Mahal: Mumtaz Mahal, the one for whom it was built, was Persian. 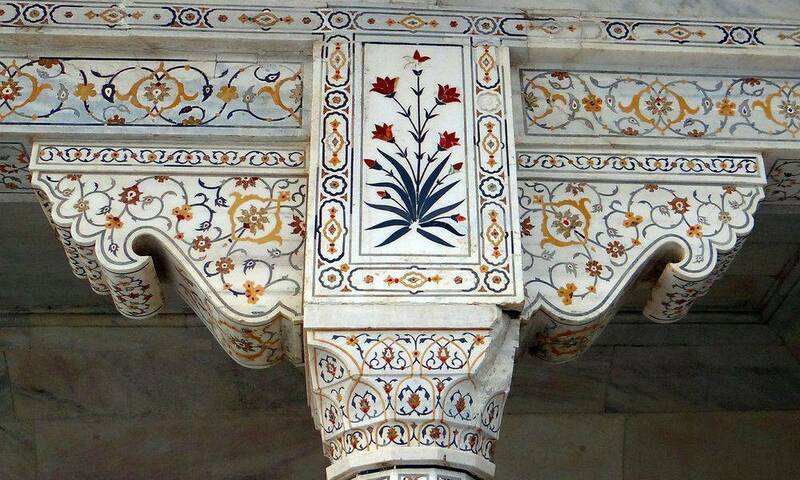 It was therefore normal that Shah Jahan included decorative elements typical of his region. It is essentially in the decoration. According to the Islamic religion, the abundance of vegetation and animals indicates well-being. It is a symbolic of Paradise. 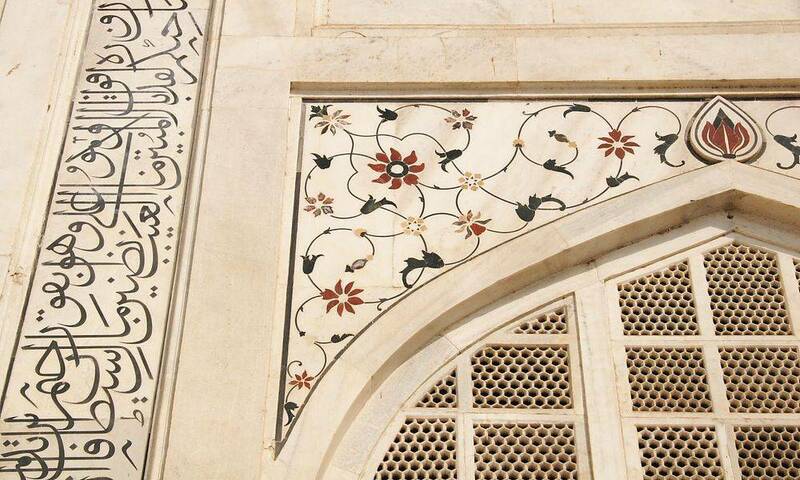 Shah Jahan has almost carved flowers on the Taj Mahal, sometimes with animal motifs. Perfect symmetry is also a symbol of Paradise, as indicated above. Just the fact that the Taj Mahal is symmetrical is a sign of Muslim influence in its construction, though it was shared by Persian art. 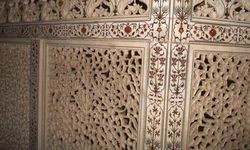 It is found in the general appearance of the monument, and more particularly in its openings, and in the regularity of the forms, but it is also found in the decorations which, if they are often of Islamizing style, are also sometimes of Hindu style. The Persian style is recognizable by the iwans. The iwans, which are found on many monuments of Central Asia, is a large porch shaped ogive, shallow. It is the counterpart of relatives of Gothic cathedrals, in Europe. The taj Mahal has 4 main iwans and 12 secondary ones, smaller, on the ground floor, and 12 more on the floor. The dome is also an element of Persian architecture. Slightly bulbous, it is the epitome of the castles of the Arabian Nights, and has been found in most Mughal Mausoleums for only two generations, before there were none. 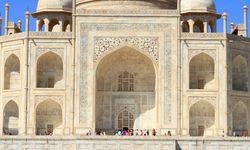 To learn more about the artistic influences of the Taj Mahal, visit the art history page in the "Secondary or higher level" section. 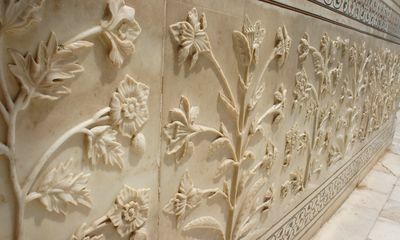 The facades of the Taj Mahal are very accurately decorated, with incrustations and a lapidary marquetry mainly in marble. The motifs are repeated face to face, all around the building. There is never anthropomorphic representation, it is due to the rejection of such representations by Islam. 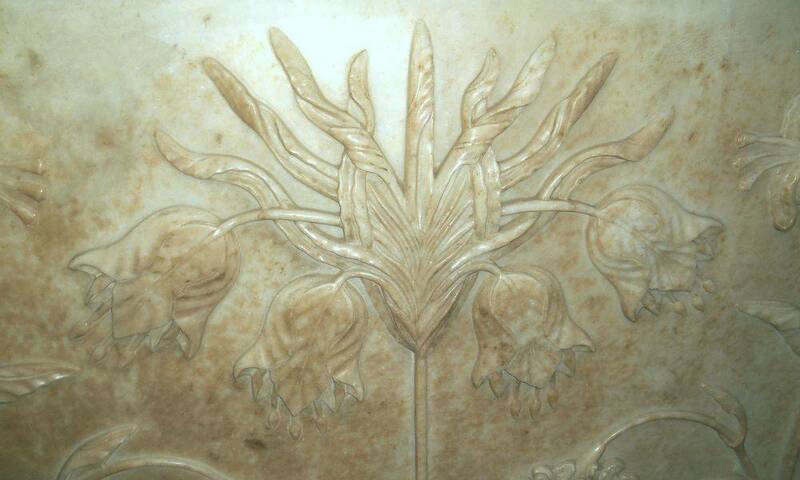 As a result, the motifs are essentially floral, plant, abstract or calligraphic. It is an abstract pattern that is the most used, the chevron. It is essentially to join the different elements between them. When the size of the surface changes, for example inside an iwan, the patterns are not adapted, they are just reproportionnés. It means they are identical, just a little smaller. 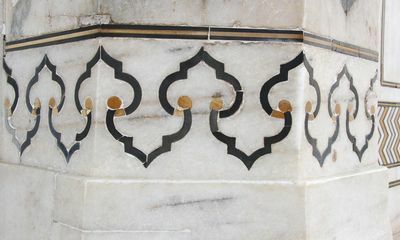 Inlays are mostly black marble, but it can also be jade. Note that the highest inscriptions are substantially wider than those at the bottom to keep the writing scale. Some of these decorations are not incrustations, sometimes there are bas-reliefs, stucco and, more rarely, paint. A fairly detailed study of the Taj Mahal's iconography shows us that it has a set of 46 different plant species, representing 42 genera and 29 recognizable families, but some plants are not, and for the good reason that they do. do not exist. 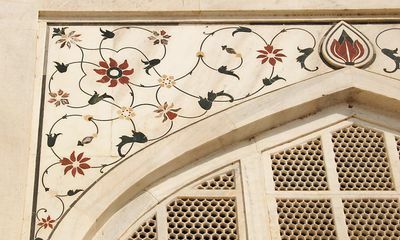 Indeed, the artists of the time wanted to make the decoration of the Taj Mahal as beautiful as possible, without taking care of the veracity of their representations. So for them, if a plant is beautiful, it is there, otherwise they create it from scratch! 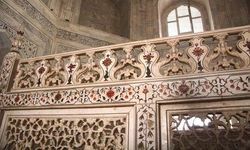 Learn more about the decoration of the mausoleum. 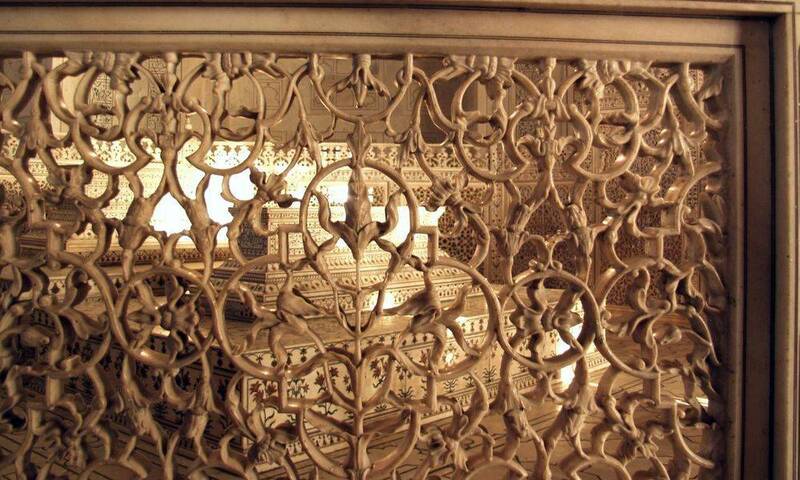 The balustrade is in the main bedroom, inside the Taj Mahal. This room is octagonal, with regular sides. In the center are the cenotaphs of Mumtaz Mahal and Shah Jahân. To protect them, they are surrounded by a balustrade whose quality of execution is of a rare example. It is also octagonal, arranged to follow the sides of the room. Each pan is 8m long and 1m20 high. It is marble, carved. 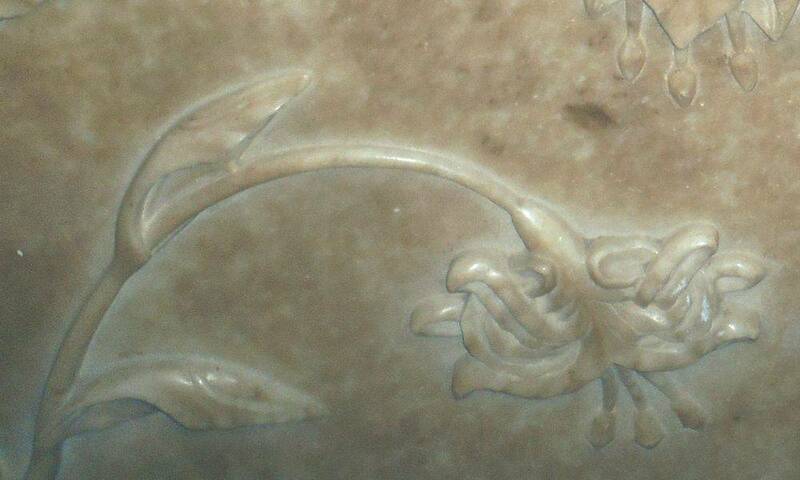 Each element is an interlacing of floral motifs, first cut by hand, then polished to a smooth glossy appearance. The smoothness of the grid is probably what marks the most, yet incrustations of semi-precious stones found in the upper frieze - also worked - are of great success and beauty. One side of the balustrade is open, allowing access to the cenotaphs, but visitors are forbidden to go there. The stairway to the roof, found only on the North and South faces. However, these stairs are hidden by the ingenious architecture of the monument, so when we look at it we do not see them. Each facade is composed of a giant porch, particularly high and shallow in relation to its height. We call it an iwan. An iwan is a Persian architectural element, it is found in many buildings - especially religious - of the ancient Persian Empire, nowadays in Iran, but also in Uzbekistan, Turkmenistan, etc. Each iwan is shaped like a warhead, which is closer to the warheads of Western Gothic art. Why such a form, for both religions? Without having knowledge of religious architecture, one can imagine that this form of tip up to the sky is an invitation to get closer to the very high, an invitation that can be found in both religions. 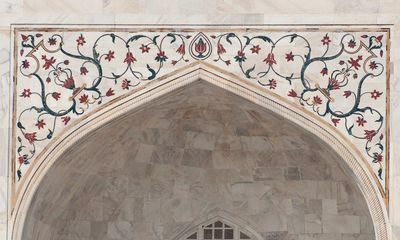 Each main iwan of the Taj Mahal facade is surrounded by a white marble frame on which is inscribed calligraphic inscriptions of verses from the Koran. The upper part is decorated with flowers, most of which actually exist. Here, they are stylized, but sometimes they are repreduced with great accuracy. The bottom of the iwan is pierced with two completely identical doors, one above the other. The one on the ground floor serves as the normal entrance to the monument, the other is actually the window of the floor, but as they are similar, one has the impression of two superimposed doors. If you look closely, you'll notice that the window is slightly smaller in the door, but that's it. The window overlooks a kind of balcony but very narrow and without balustrade, so it's just another decorative element used to emphasize the vertical passage between the ground floor and the floor. The door itself is decorated with many floral motifs. The main iwan is flanked by four smaller secondary iwans, two per side. 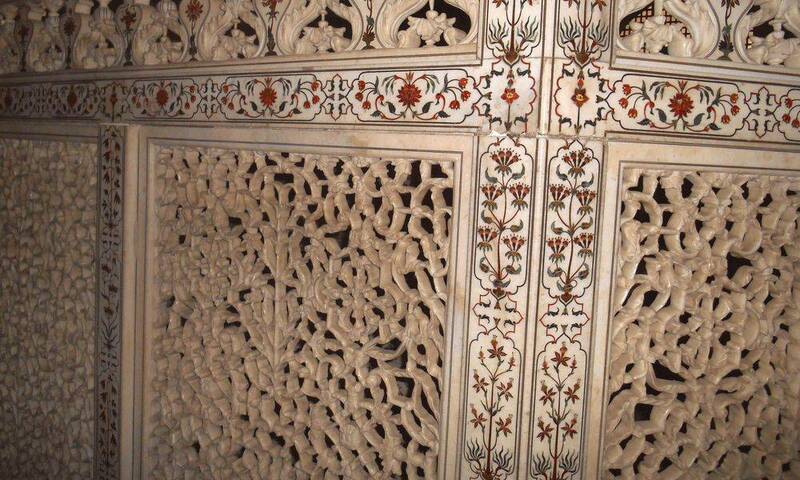 They are all proportional to the main iwan, but their bottoms are pierced only by a rectangular, classical window. 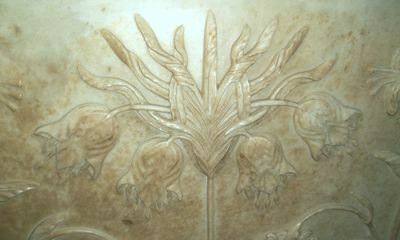 They are also decorated with many floral elements, identical from one to the other. 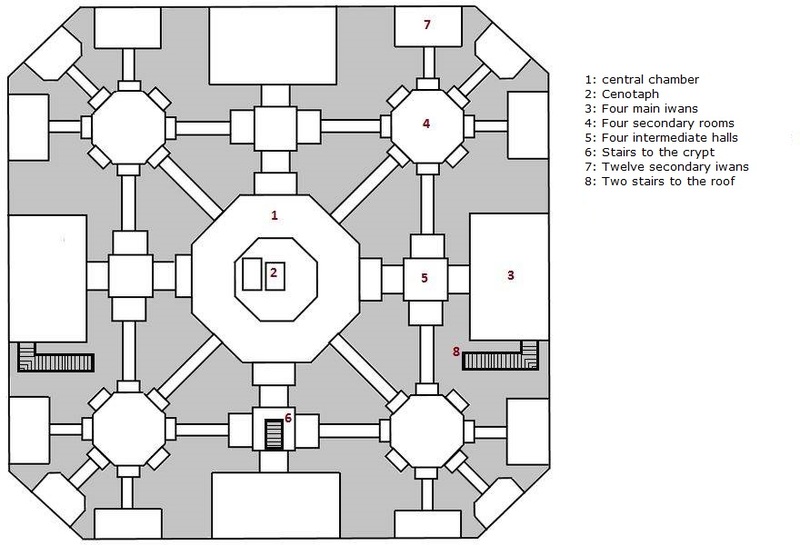 Finally, the four facades of the mausoleum are connected by four small facades arranged at 45 ° and taking up the two superimposed iwans. This secondary facade, the main face and the two small facades on either side of the main one are separated from each other by an octagonal column decorated with geometric motifs. These columns are divided into 4 pieces separated by discs standing out of line with the column. The top of the facade is surmounted by a balustrade decorated with regular geometric patterns, it serves as protection for people on the roof. This balustrade forms a crown to the facades, crown dominated by the imposing dome. The facades as the iwans are white marble, but they are not massive walls. In fact, the mausoleum is in red sandstone covered with white marble slabs. By looking at them, we can easily see the small marble squares because each one of them has its own rib, a single color, etc. So we see that the facades are a mosaic of marble plates of size often identical, but by location, that is to say that all the plates surrounding the inscriptions are the same size, but the one adorning the bottom iwans are different. The background of iwans, precisely, is composed of niches whose traces are made in relief. They are not so badly distinguished that the difference in color of each plate takes precedence over the relief, but the effect is remarkable. The inlays of flowers are perfectly visible above the iwans, they are generally red, yellow, and green, but may have other colors. The reasons are identical from one iwan to the other, whether the principal and the secondary ones. The inlays were made using the technique of pietra dura, popular in Florence in the seventeenth century. It is besides Italian artists who came to make work, on the spot. To learn more about this technique and see all the decoration of the Taj Mahal, see the Taj Mahal Decorations page. 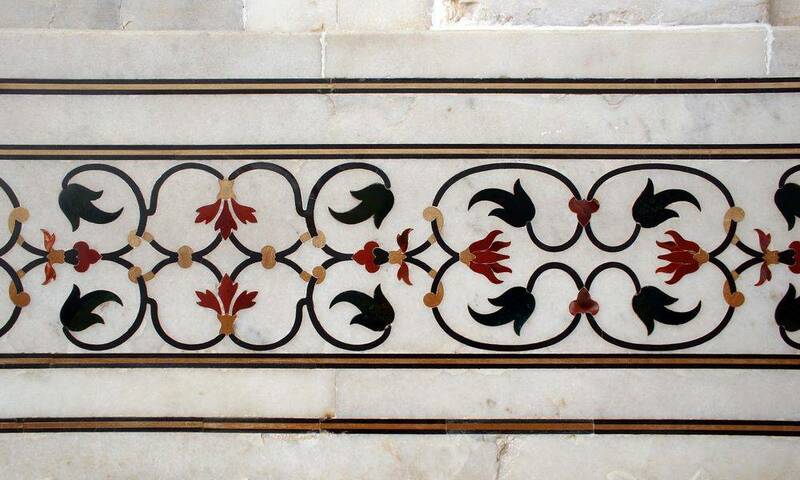 The calligraphic inlays were made in the same way as the flowers, in pietra dura. These are verses from the Qur'an calling the sage to Paradise and threatening the Depraved of Hell. A classic theme, then. What marks here is the quality of the work, whose precision marks the spirits still today. 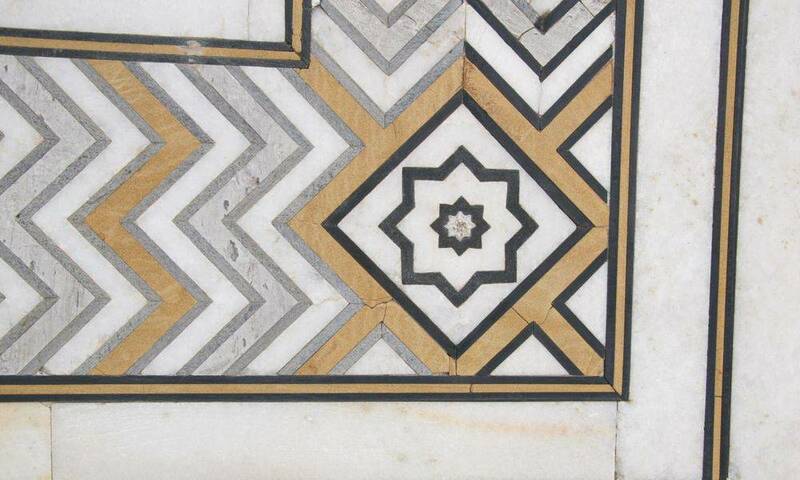 The black marble that was used for these inlays is of very good quality. Finally you must know that the pietra dura is not the only technique used to decorate the Taj Mahal. Low relief was also used, on marble plates placed inside the iwans - and also inside the mausoleum - all along the walls, about one meter in height. These plates represent existing or sometimes imaginary plants. 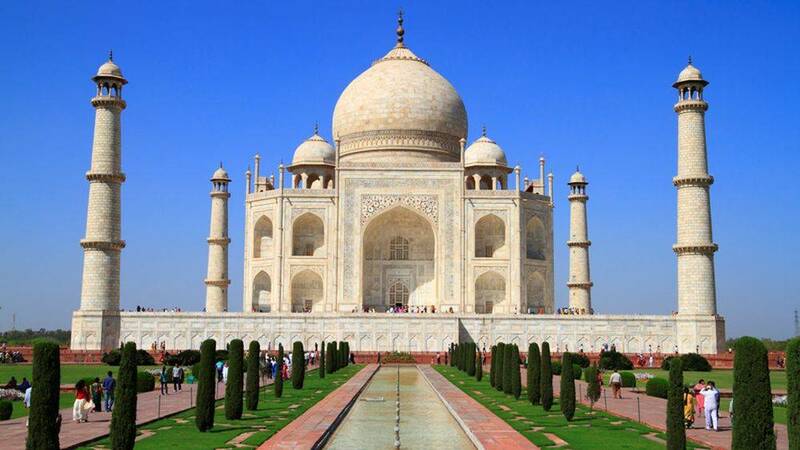 Studies have been done to analyze these plants and their results have been disseminated, there is more information about this on the page devoted to the decorations of the Taj Mahal. The interior of the mausoleum of the Taj Mahal consists of a main room, central, 4 secondary rooms per floor, and 4 intermediate rooms. The master bedroom is by far the most interesting because it is the largest, the tallest, the most impressive and is the one for which visitors have the most interest. It must be said that there is only in this one that there is something to see, the others being empty rooms. The interior layout of the Taj Mahal is as much symmetrical as the exterior. The center piece occupies the center, as the name suggests, and at the four corners are the secondary chambers, also octagonal. The intermediate rooms are just antechambers allowing access to the main hall. It is rather tall and tall, shaped like a regular octagon. Each of the 8 sides is pierced by a door leading to either an antechamber or a secondary chamber. The room is high, there is a floor of the same shape. In place of doors, there are windows, but of the same shape as the doors. A balcony goes around, leading to the secondary rooms upstairs. The vault is high, it rises to 35m in height at its highest point which descends a very imposing central chandelier. What is interesting in this room is the balustrade separating the audience from the two cenotaphs. 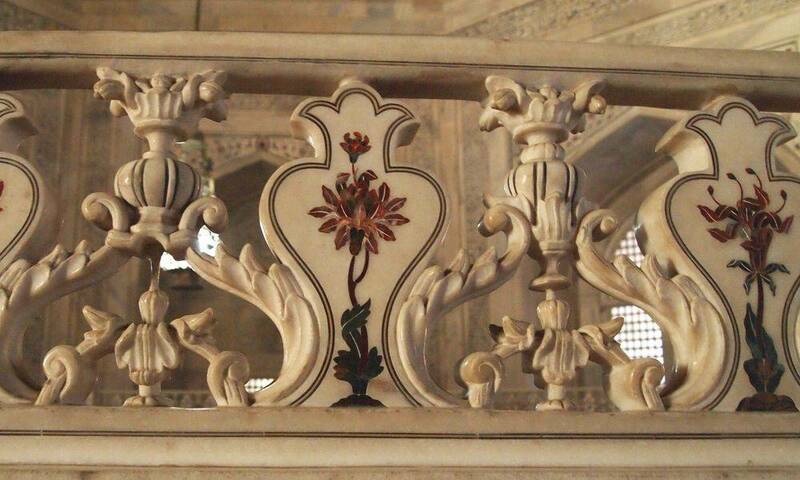 This balustrade is made of marble, it has been patiently engraved, hollowed out, then polished to form beautiful floral motifs. A close look at it reveals impressive details that give this object the quality of a masterpiece. 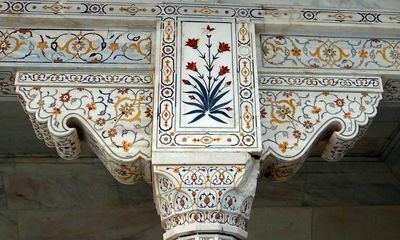 It is also decorated with a high and low ramp very largely decorated with flowers inlaid with the technique of pietra dura. See also the Taj Mahal set page for more information on this topic. The balustrade makes room for some grids whose passage leads to the cenotaphs, which we see through. 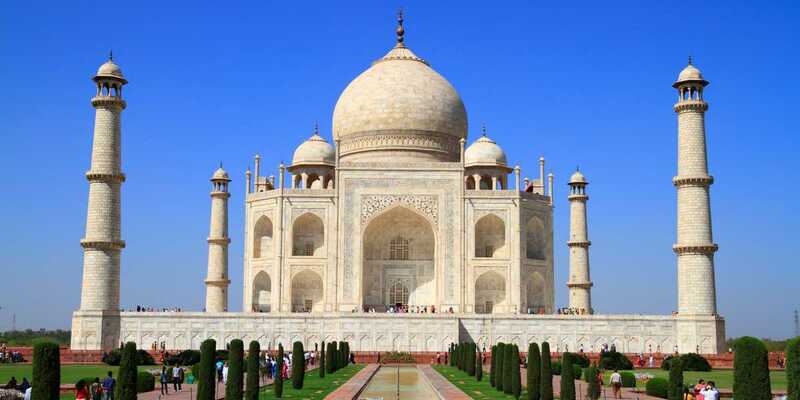 The largest is that of Mumtaz Mahal, the wife for whom the building was built. It is in the center of the room. 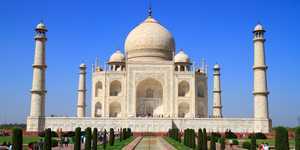 The other cenotaph is slightly smaller, that of her husband, the builder of the Taj Mahal. It belongs to the Emperor Shah Jahan. They are both as richly decorated as the rest of the building. Recall that a cenotaph is a false tomb, it is a tomb in which there is no body. 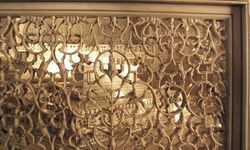 The bodies are in the ground in the crypt, below, according to the Islam that wants the bodies to be buried in the ground. 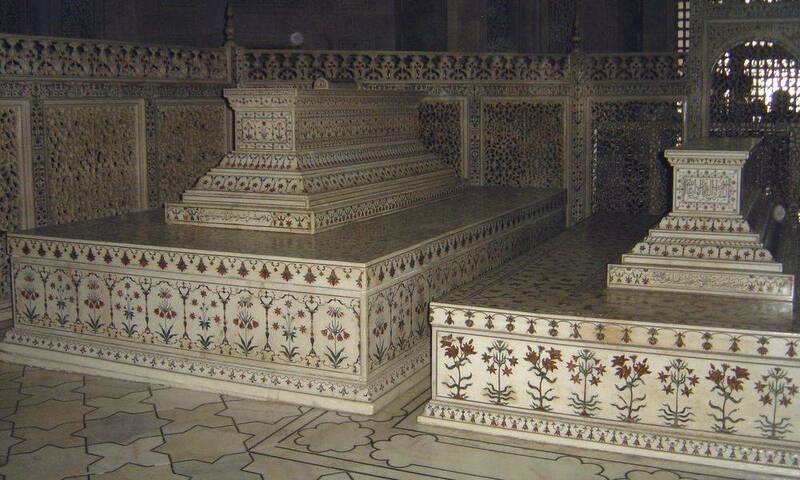 The other parts of the mausoleum of the Taj Mahal are smaller and above all perfectly devoid of any furniture. They have an interest in the low relief decorations placed at the bottom of the walls and running everywhere, on all the walls of the building. These sets are impressive by their qualities but also by their numbers. The dome of Taj Mahal is characteristic of Persian art. Definitely associated with the tales of the Arabian Nights, this particular form of Persian domes feeds the imagination of generations of readers. That of the Taj Mahal is particularly well proportioned. It is bulbous, ie bulbous. He is mounted on a drum. A drum, in architecture, is a very wide and shallow cylindrical piece on which the domes rest. There is not one systematically, but the Taj Mahal has one, like many other buildings in this area and this time. The drum of the Taj Mahal is still 7m high, which is not bad. At its summit is a point rising to the sky formed of two floral balls surmounted by an Islamic cruiser itself surmounted by another flower, a lotus. This element is metallic and slice on the marble of the dome. He raises it even higher. The roof, which is accessed by a lateral staircase on the south side, is shaped like a terrace and allows the walk on the whole building and in particular to the four annexed domes. These are much smaller than the main dome, they accentuate the elevation of the building and thereby make it more airy than it really is. 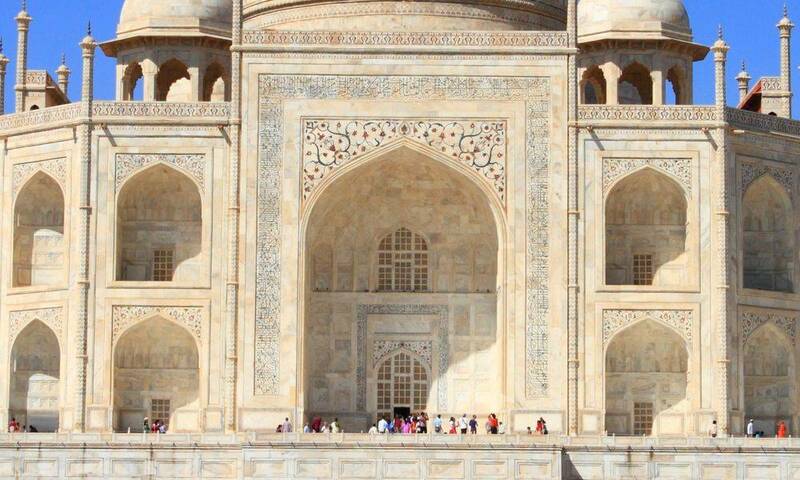 Learn more about the bulbous dome of the Taj Mahal. The so-called Chameli Farsh is the terrace located to the north of the Taj Mahal complex. 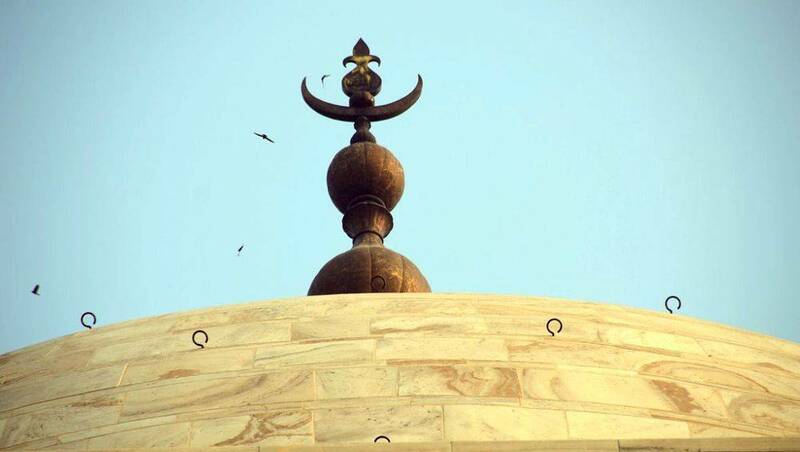 The most sacred part of the monument rests on it: the mausoleum, the mosque, and the guest pavilion. It is 7m higher than the normal terrain, but there is a gentle slope to get there. South side, there are the gardens, it is the normal course of the visitor while North side flows the Yamuna river, which borders the monument. The point of view is worth a look elsewhere. The northern part, facing the river, is called "Tahkhana". It is a wall made of river stones inlaid with marble and with arches. If we go a little closer we can see that these arches are connected by a narrow gallery that joins the 4 corner pavilions, which we see as outer towers. The soil is made of a red material with a particular texture. It seems delicate, fragile. In the shade one can have the impression of a fabric of red velvet. The terrace contains on its right the mosque and on its left the guest house (jawab). In the center there is the main mausoleum in white marble. The latter is placed on another marble terrace measuring 93m square, perfectly square. It is in the center of the main terrace. The mausoleum is thus isolated from the rest of the world by two successive terraces, showing the will of the builder to put on a pedestal the tomb of the wife of Shah. 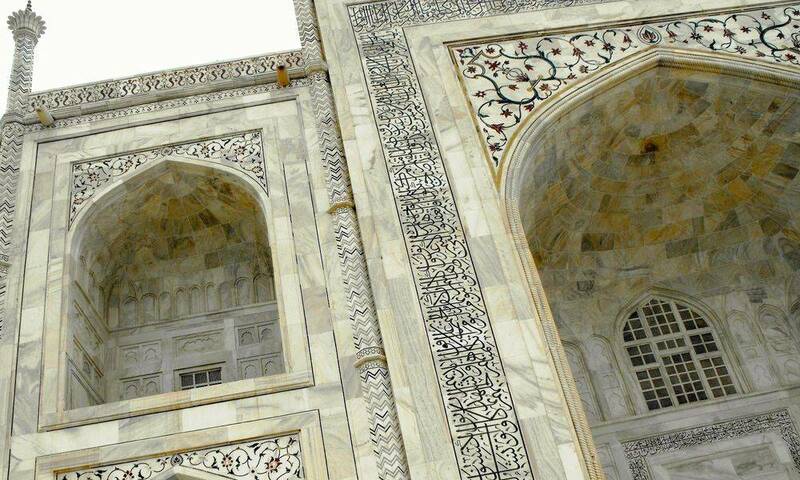 This second terrace is entirely covered with white marble slabs, just like the Taj Mahal. It's a good guide to know when to take off your shoes. Indeed, the Shameli Farsh is sacred, there is a Muslim mausoleum and a mosque, so you have to sacrifice to religious obligations and take off your shoes. There are lockers for that, of course before getting on the terrace. It means that everyone on the 2nd terrace is barefoot.